Still need to sort your Christmas food? We’ll deliver your whole organic feast in one box, in time for the big day. 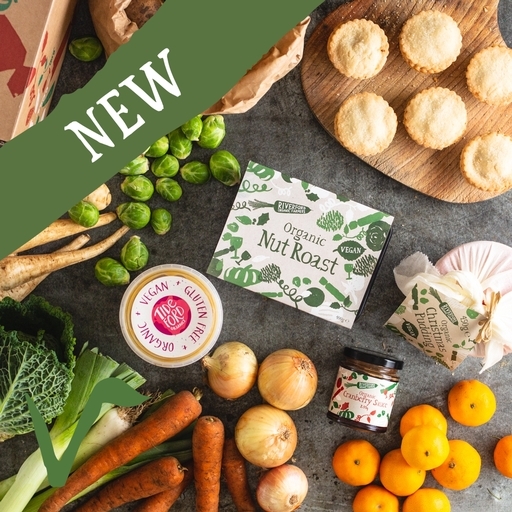 It’s packed with everything you need: a small festive veg box, a hearty nut roast, fresh cranberry sauce, and deliciously savoury gravy with red miso. For pudding, there’s 6 mince pies, a traditional Christmas pudding, and zesty clementines. Fruit and veg is grown by us, or by small family farms we support for the long term. Nut roast, cranberry sauce, mince pies and Christmas pudding are all handmade to our own recipes, by our friends at Pegoty Hedge, Kitchen Garden, The Authentic Bread Company and Crosbies. Vegan mince pies: Wheat Flour (Wheat, Calcium Carbonate*, Iron*, Niacin*, Thiamin*), Coconut Oil (16%), Apples (9%), Currants (9%), Sultanas (9%), Cane Sugar, Brown Sugar, Sunflower Oil, Candied Peel (2.7%) (Orange Peel, Lemon Peel, Glucose Syrup, Salt*), Raisins (2.1%), Orange Juice, Cognac (1.5%), Cider, Mixed Spice, Flaked Almonds, Cinnamon, Nutmeg, Ground Ginger. Vegan Christmas pudding: Sugar, raisins, sultanas, beer (water*, barley, sugar, yeast, hops), currants, breadcrumbs (wheat flour), deodorised coconut oil, self raising flour (wheat flour, mono-calcium phosphate*, sodium bicarbonate*, calcium*, iron*, thiamine*, niacin*), apple, mixed peel (orange, lemon, fructose syrup), brandy, lemon zest, orange zest, mixed spice (coriander, cinnamon, ginger, nutmeg, fennel, cloves, cardamon), nutmeg, cinnamon. Tideford vegan gravy with red miso: Water*, Onion, Carrots, Celery, Red Miso Paste (water*, soya beans, rice, sea salt*, yeast*, koji culture*), Cornflour, Vegetable Stock (sea salt*, maltodextrin, rice flour, onion, yeast extract*, sunflower oil, carrot, parsley, turmeric, parsnip), Garlic, Sunflower Oil, Creamed Coconut, Caramel, Black Pepper.